Today is a good day for art! This amazing Klingon painting, depicting an eyepatch-wearing Klingon leader going into battle, comes from Star Trek Online concept artist Chris Legaspi. Check out more of our favorite epic Klingon art below. 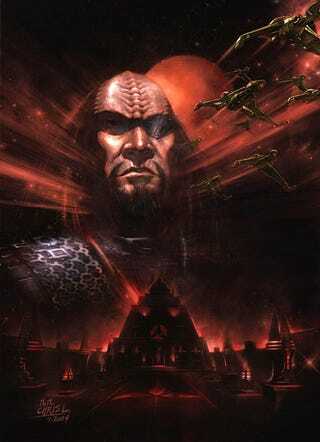 According to Legaspi's blog, Star Trek Online submitted this incredible Klingon painting as the cover of the current issue of Star Trek Magazine. Because the magazine's editors have no honor — just kidding — the image appears inside, instead. But we still honor the Klingon way, and to prove it here are some of our favorite Klingon paintings. Qapla'! From the House Of Korax. More at the link. Worf, by Herb Leonhard. More at the link. Birds Of Prey, painted by Sonia Hillios. More here. Legendary Space Encounter by Randy Asplund, pianted for the box of a model kit. More at the link. Klingon Battlecruiser Kortoh by Randy Asplund, pianted for the box of a model kit. More at the link. Klingon Battlecruiser Amnok by Randy Asplund, pianted for the box of a model kit. More at the link. Klingon Bird Of Prey by Randy Asplund, pianted for the box of a model kit. More at the link. 2300 Space Melee by Randy Asplund. More at the link. Klingons Crossing the Delaware, by JudgeFang on DeviantArt. Worf's Bat'leth, via House Trekkan. Kingon Hunting Party by James Cukr, via House Trekkan. Cover to Klingons: Blood Will Tell #3 by Joe Corroney. K'Mona Leesa, by Mark Brill. Unused Klingon Battlecruiser concept art by John Eaves. Way more at the link. Beauty And The Beast by MalyTrakTorek on Deviant Art. Way more at the link. Klingon model box art by Rick Wawierna, via Concept Ships. Klingon Propaganda Poster featuring Original Klingons, credited to "F. Boichat '75" and sold at Star Trek conventions in 1970s. Via Elwyn/Elwynsattic on Flickr. The cover of Vanguard 3: Hot Pursuit by David Mack, by Doug Drexler. Way more at the link. Klingon ships, from Ships Of The Line book cover, by Doug Drexler. Way more at the link.